The bad news is you’re falling through the air, nothing to hang on to, no parachute. The good news is there’s no ground. It’s been a pretty exhilarating year thus far. The fact that February is coming to a close is pretty mind-boggling. Sometimes, I have that feeling that I’m not documenting enough but, as the subject line states, breathing is important. I’ve turned blue a few times this year already due to depriving myself fresh air and relaxation. Recently, I started a new role with Asterisk Magazine + Gallery as the space’s curator. Being a San Francisco native, my involvement with Asterisk has been instrumental in my growth and development as a writer. I’ve learned a lot about engagement with the community. Although the experiences have differed greatly from my research, its been integral in my understanding of how people want to read, see, and experience art (and content, both physically and virtually). I will keep this short and sweet but I invite you, dear reader, friends, and family reading this post, to pay the Asterisk Gallery a visit some time this month and give feedback. On a side note, I recently found out that I got into graduate school! I’m still overwhelmed but really happy about the rest of the year and diving into my research. Rest assured, I believe breathing and meditation will take precedence in the very near future. Currently balancing a full-time 9-5 job, blogging, and Asterisk have proven that stopping every now and again to take a walk and take in some oxygen is muy importante. Again, I invite you to visit the gallery and check out my new academic home for the fall here. Underneath a US interstate freeway in San Francisco’s South of Market District, on the border of Potrero Hill and Downtown San Francisco, one will not only find quite an industrious area, but a place tucked away from the busy street that encapsulates the vibrancy and pulse of the San Francisco culture and arts community. The SOMArts Cultural Center’s location is apropos considering its ambitious yet successful representation of an incredibly diverse community. The entrance is adorned by rock sculptures and benches reserved for cigarette breaks or art talk when the galleries are filled with people on opening night of any exhibition. With theatrical productions to large scale art installations, the center garners much of its attention through representations of the community, cultures, and sub-cultures that call the Bay Area-San Francisco home. Executive Director, Lex Leifeit, reflects on the balance the center must strike between showcasing traditional and cultural aspects of its diverse population with experimental and contemporary interpretations of the very traditions that create the community, The word traditional is tricky. Each culture has its own traditions. When people talk about traditional art in the art world, they’re often looking at it from a western perspective. As a community center, SOMArts provides below market value space for interested organizations looking to produce a show or install an exhibition. From visual artists to writers to educators, the center draws patrons and supporters from a multitude of disciplines through several annual events that include Feast of Words and 100 Performances for the Hole (originally conceived by Curator and Gallery Director Justin Hoover). The center also includes a lot of critical discussion through its Commons Curatorial Residency providing curators the opportunity to create an exhibition that encourages the community to engage and learn about art and artists’ practices that may not be readily accessible. Such a residency makes this discussion and dialogue available. Another aspect of the community engagement includes the SOMArts Interactive Video Channel, which fosters community engagement between SOMArts staff, artists, curators, and art lovers. To exist within an art community and thrive, one must be able to grow, learn, develop, and maintain an incredibly multi-faceted practice to stay relevant. To take it a step further, as an arts educator and practitioner, it is imperative to make work that is accessible to the public and be ready to engage. Jenifer Wofford is a rare gem in the arts. From artist residencies in Denmark, Italy, and most recently, Norway, she continues to make profound connections between ideas, cultures, and people through her work. Her travels and thirteen years of providing arts education in the San Francisco Bay Area public school district as well as at the university level, including California College of the Arts, UC Berkeley, and University of San Francisco have produced a unique combination of art practice and theory that illuminates as much as it entertains. Wofford thrives on collaboration and participation from her peers as a part of the creative process. Her observations, conversations, and dynamic global studio practice are not only imaginative but showcase a multitude of talent across genres. I had reasonably rigorous training in the traditional plastic arts, and so, even if I veer off into more performative or experimental practices, I still often begin from a hands-on, drawing-based approach. I also enjoy drawing, particularly with ink, more than other forms, so it’s the easiest, most straightforward form that I can express myself in. Some projects and ideas reveal themselves to be best suited to remaining within the two dimensional realms of painting and drawing; other projects reveal themselves to be better addressed in video, performance or installation. In addition to her fine arts practice, her illustration and design work are characterized by strong, bold, non-tentative lines. 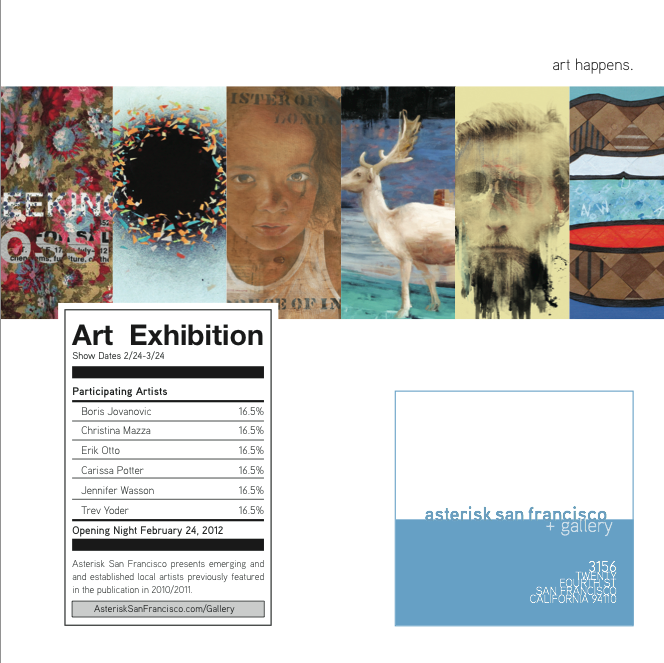 Past work include, Flor 1973-78, which was a San Francisco Arts Commission Market Street Poster project. Flor provided a fictitious pictorial narrative of a Filipino nurse’s journey from the Philippines to the United States in the late 1970s that included visual references to both the cultural and political climate of the times. In looking at Filipino-American culture and history mixed with tongue and cheek humor, individuals can easily use her work as a point of departure for discussing identity and culture without it being overly abstract and complicated. Her current work, Grand Tour, tethers representations of real-life people to fictitious stories that one wishes were true because Wofford crafts such engaging tales through her drawings and paintings. Lastly, performance-based work with art collective Mail Order Brides will have you convinced that artistry necessitates being a maestro of creativity. You will inevitably find something telling in the way she narrates a story that is intelligent and witty. With a myriad of skills, the common thread, as Wofford explains lies heavily on creating work that allows people a rich experience of art. There’s always a subtle, or maybe not-so-subtle, politic at work underneath my artworks,” says Wofford. “While the art world is ever-more international, there’s still something of a dearth of voices and perspectives coming from women and people of color, as well as a limited perspective represented from the non-Western world. Since I come from a mixed-ethnicity, mixed-nationality, Third Culture, feminist background, I’ve often felt like I’ve been blessed with a unique opportunity to speak from this perspective, and to give voice in my various projects to something beyond simple formalism or more generalized or codified concepts within Western art. That said, I don’t think I’m doing anything particularly radical, and I dislike anything that smacks of being overly agenda-driven. It’s important to me that my work feel accessible on a number of fronts, and to still retain both a sense of play as well as some formal chops—as far as technique and execution go. Southern Exposure’s public art grant program celebrates its first commission tonight! I was happy to supply a bit of 19th-century-inspired typography for the graphic design of the mailer (read the essay)…. 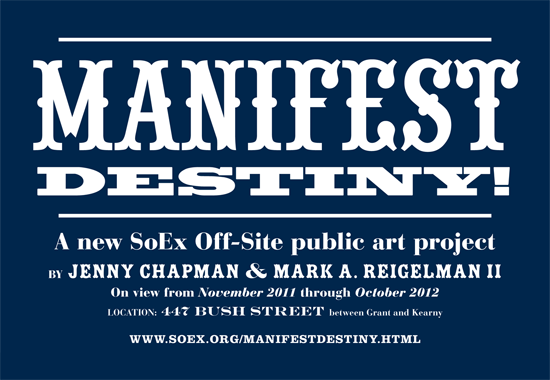 Jenny Chapman and Mark Reigelman’s Manifest Destiny! is a temporary rustic cabin occupying one of the last remaining unclaimed spaces of downtown San Francisco – above and between other properties. Using a 19th-century architectural style and vintage building materials, the structure is both homage to the romantic spirit of the Western Myth and a commentary on the arrogance of Westward expansion. The installation will remain in place and be slowly transformed by the elements through October 2012.